Lol emoji shawty RT @CwHyAnRiLtOaTTE: I love my new phone!!! @ppair96 glad to know I'm not the only one apparently struggling with my mortgage!! @kayerodriguez Masanting neman? Try taya next time. @AidaSans thank you.. <--that's a smiley face btw in case you don't have emoji. 03 Oct 11 copy & paste +upvote -downvote @AidaSans thank you..  &lt;--that's a smiley face btw in case you don't have emoji. RT @alboimpasiente: @JuanPedroTV como estas compadre.. cuando un nuevo capitulo de #canalocho? // se esta subiendo! XD en un par de horas! 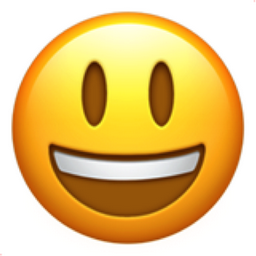 Like Smiling Face with Open Mouth Chronological Emojitweets 3?